This chart ranks the favorite social networking platforms among American teenagers. When it comes to their social media preferences, U.S. teens are about as loyal as Brutus was to Caesar. Back in 2013, Facebook was still their social network of choice. In 2014, Instagram took the throne for a while before being replaced by Snapchat in 2016. 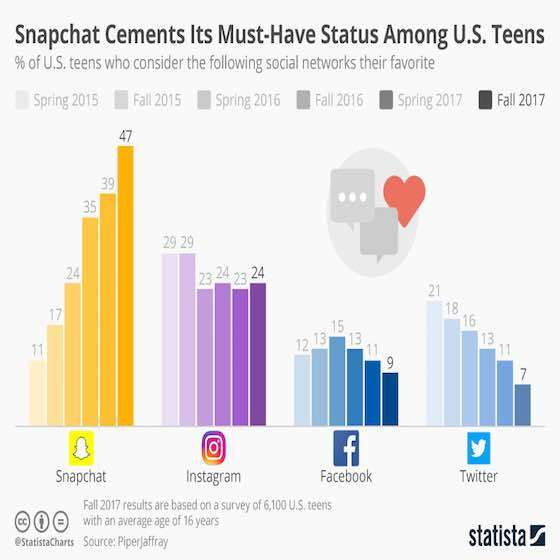 Now, in the fall of 2017, Snapchat is the clear number 1 for teens in the United States, with nearly half of the 6,000+ teenagers polled for PiperJaffray's bi-annual “Taking Stock With Teens” survey naming it their favorite social platform. 24 percent of the teenage respondents called Instagram their favorite, while Facebook and Twitter are losing touch with the teen demographic. So how do these numbers translate into actual usage? Are teenagers really abandoning Facebook in droves? Not quite, apparently. According to this year's spring edition of PiperJaffray's report, more than half of U.S. teens still use Facebook at least once a month. The same holds true for Twitter, which is used regularly by 56 percent of U.S. teens. Snapchat and Instagram hold their ground in terms of usage as well: both are used at least monthly by around 80 percent of young Americans. Internet & Social Media: "Snapchat Number One Among Teens "